Is it bamboo? Bambou? Bambus? Bambusz? Bambu? Bambiq? Tap, tap , tap….over time, hundreds of fingers tapping against the top tube, listening for the hollow sound of steel….or actually, yes, bamboo. A favourite pastime of ours is sitting in a cafe, or preferably a bar…..watching strangers approach the bikes as we gaze from a window. Faces of disbelief, double takes, photos, animated conversations and smiles. Is it strong? Over 10000 kilometres and still going strong. Several 1000 kilometres of rough roads or at least on surfaces not really deserving the description of a road. Jarring pot holes, corrugation, rocks, sand, and below zero temperatures, rain, snow and searing heat where the bitumen melts, flinging up a sticky mess and adhering to tyres, caking mud guards until the wheels no longer turn. We were slightly alarmed when Li’s down tube developed a hair line crack in Istanbul. We were not concerned about the overall structure, but concerned that the crack would allow moisture inside, and possibly rot if unable to dry out. We filled the crack with epoxy, the same glue used in fabricating the lugs and wrapping and securing the carbon fibre ribbon joints between the tubes. Almost 5000 kilometres further on and the crack has not developed or caused any problems. If the bamboo were to break…..I am confident it will not without a considerable impact…..it could be easily repaired by ourselves with techniques and materials similar to their original construction. Had we been riding steel framed bikes we would be reliant on finding a welder should the frame fail. The failure of a carbon or aluminium frame would be likely unrepairable. We are confident on the qualities of bamboo and the qualities are proving reliable. Other components…..not so. My basket made of 10mm alloy tubes which I adore and would purchase again is bending due to the constant rattling, as well as occasional airborne bumps and jumps. Nuts and bolts are constantly loosening and requiring frequent attention. Our panniers are also losing bolts and screws, and on the worst of roads falling off or requiring extra strapping or stops to re-secure……whilst the bamboo is holding strong. Our mistake in constructing the bikes was a rushed finish where the bottom brackets were installed backwards. This resulted in a false start on day one when we returned to London to repair Li’s bike, and several months later, a return to Prague to find a mechanic to repair mine. We have had 6 punctures between us. My Panaracer tyres having none in 7000 kilometres before they required replacement due to wear. I have had one broken spoke, before the rough roads and likely due to the horrid “wheel bender” cycle parking which is avoided by any sensible cyclist. I was quite chuffed that after a brief lesson in truing wheels before our trip, I was able to replace the spoke satisfactorily while on the road. The Rohloff gearing in the rear hub is a dream and something which we put even more confidence than the bamboo. Our confidence in this product has not let us down and was the reason we chose to go with hub gearing……oh…..and the fact I am rubbish at changing dérailleur gears! climbing with conventional gears my shift is followed by crunching and grinding as mu chain falls off. Changing gears on our bikes is a dream and anyone knowledgable about Rohloff ogles the hub even more than the bamboo. All in all, Esther the Beast and Hank the bamboo bikes are doing well. 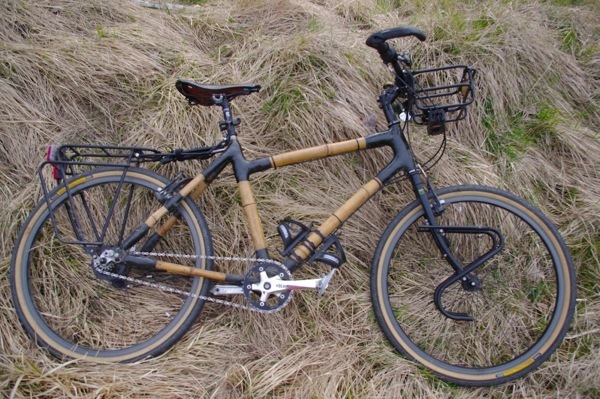 2 Responses to "Bamboo bikes"
They really are extraordinarily beautiful.